Looking for a budget tablet? Jarir Bookstore sent their latest brochure today for budget tablets ranging from SAR 700 to SAR 499. They offer Media Pad & MSI Enjoy tablet on that range. The Huawei Media Pad with calling option cost SAR 799 and without calling option cost at SAR 599 both tab is with 8GB storage capacity. 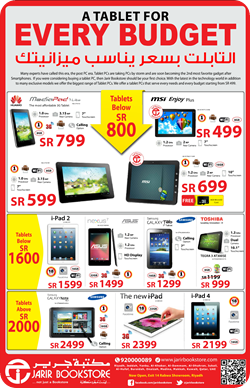 The other tablet as shown in their offer is MSI Enjoy which cost SR 499 for 8 GB and SR 699 for 16 GB. Check for other option on the ads below. The choice of tablet should depend on your preference as a user, if you would like to store tons of files like music, video and E-book I would suggest buying those with higher storage capacity but of course with a higher price. I would prefer buying iPad 2 at 64 GB rather than buying the latest version of iPad or buying low cost tablet. If you want to utilize the tablet for social media, browsing the internet, application such as Viber or any such kind of application, I believe you can buy this low cost tablet. But of course time will come that you will be techie and you want to synchronize all your files to your tablet from your computer (This can be done through dropbox), so when that time comes, it will mean that you will need to upgrade your acquired gadget. Donâ€™t expect a high response from this budget tablet. If you plan to use your tablet for gaming purpose, I suggest to buy those tablet with higher specification. Nexus, iPad or Galaxy Tab would be a better choice. Tablet should be chosen not with its price but with its usage. You need to be wise in every halala that you spend while in Riyadh Saudi Arabia so that you will be able to feel why it is best to be Saudi Arabia as compared to other places in the world. Just a simple reminder, buy within your means, do not buy gadget just because your officemate have it or just to show everybody that you have the latest gadget. Gadget should be bought because you need it and not because you want it.